Want to grow just one or two large plants? 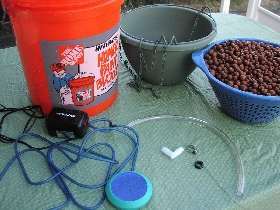 Then bucket hydroponics, or the "Bucket Bubbler" is for you! A bucket hydroponic setup is very popular for growing a few large specimens in small spaces. They are simple and cheap to build, low maintenance, and the plants love it. The Bucket Bubbler is a combination aeroponics/deep water culture system, and we have gotten some very impressive results from it. I always keep one growing in my office, as I love the soothing "water sounds". The plant sits in a net pot (or growpot with lots of drainage holes in it) which is suspended over a bucket of aerated nutrient solution. The roots grow through the drainage holes, reaching into the solution below. It eventually forms a large "root ball" in the bottom of the bucket. Interested in a larger, 6-plant, 18 gallon Hydro bubbler system? Get the plans in our Grow Box E-book, or find instructions for an open air bubbler system here: The Hydro Bubbler. Note, there is a link at the end of the series to a nice printable booklet of the process! Not ready for a large hydroponic garden yet? Get started below with our single and simple bucket bubbler FREE PLANS. These work great for one or two large “specimen plants”. They can support a slow-growing plant like a fig for the long-term. There is plenty of room in the 5-gallon bucket for a large root mass, which means a large plant will thrive in it. Bucket bubblers are super easy to construct and get growing, and they are too cool! I love them and keep one going at all times in my office. Most of the needed materials are available from Home Depot or the hardware store. A couple items must come from a hydroponics supplier (but we tell you a good source). Bag of LECA (Hydroton or clay balls) More on this and ordering info later in the Tips 'N Techniques section.